4192: The Crowning of the Hit King :: Movie Information :: RabbitTV GO! Cincinnati's Riverfront Stadium, on a warm September evening in 1985: Pete Rose is poised to collect hit number 4,192 of his long, brilliant career, passing Ty Cobb as the all-time career hits leader and securing his place as baseball's new "hit king". Rose comes up to bat in the first inning against the San Diego Padre's Eric Show, the sellout crowd of 52,000 on bated breath. In 1963 Pete Rose sprinted to first base on a walk, the same everyday devotion that garnered him the nickname, "Charlie Hustle." Baseball would never be the same. 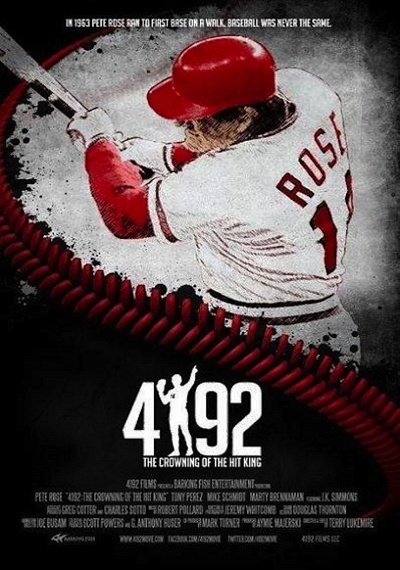 "4192" traces the Hit King's rise as one of baseball's greatest and most controversial stars, from Pete's first at-bat to that immortal September evening where history was made. Pete Rose was perhaps the most versatile player in Major League Baseball history, having played five hundred or more games at five different positions in his twenty-four year career. In his awe-inspiring career, Rose amassed numerous major league records including most hits, most games played and most at-bats. He was the 1963 NL Rookie of the Year, the 1973 NL MVP, 1975 World Series MVP, won two gold gloves, three World Series rings, and appeared in seventeen All-Star games among other notable achievements. "4192: The Crowning of the Hit King" tells the story of a boy, with limited natural athletic ability, and his father, whose mantra is to win at all costs. But at it's heart, beyond the awards and statistics, this is a baseball story about a man who loved to play the game and what drove him to chase a record that had been deemed unbreakable. It is the story of a Pete Rose that is often forgotten amongst the gossip: a ballplayer with a divine bat and a true passion for the game. The same Pete Rose that once said that he would "walk through fire in a gasoline suit to play baseball."